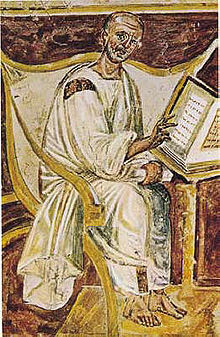 or Saint Augustine was one of the most important figures in the development of Western Christianity. In Roman Catholicism, he is a saint and pre-eminent Doctor of the Church, and the patron of the Augustinian religious order. Many Protestants, especially Calvinists, consider him to be one of the theological fountainheads of Reformation teaching on salvation and grace. He is also officially considered a saint by the Orthodox Church. Born in Africa as the eldest son of Saint Monica, he was educated in Rome and baptized in Milan. His works—including The Confessions, which is often called the first Western autobiography—are still read around the world. "On the Lord's Prayer," an excerpt from a sermon in The World's Famous Orations. Te Deum is sometimes attributed to Augustine and Ambrose of Milan, but this authorship is disputed. "Augustine," in Dictionary of National Biography, London: Smith, Elder, & Co., (1885–1900) in 63 vols. “Augustine (1. )” in Encyclopædia Britannica (9th ed., 1875–1889).